Astaxanthin Market size was over USD 550 million in 2017 and is estimated to exhibit over 4.8% CAGR from 2018 to 2024. Increasing consumer spending on personal care and cosmetic products along with growing awareness regarding nutraceuticals will primarily drive the astaxanthin industry growth. Growing life expectancy resulting in more ageing population ratio, which in turns propelling demand for anti-ageing cosmetics and other products. Numerous benefits offering pertaining to brain health improvement, maintenance of skin glow, and healthy vision are among the key properties driving customer preference towards astaxanthin based cosmetics demand. The ingredient is gaining popularity and acceptability in numerous wellness spa service providers and cosmetics manufacturers owing to its skin-friendly and anti-oxidant properties. Majorly, the industry’s revenue is influenced by aquaculture applications. The fish farmers are increasingly using astaxanthin, to colour throughout, crustaceans, and salmon in artificial ponds. The consumers check the fish quality by pigmentation on them, that occurs due to astaxanthin consumption. This will further improve the product sales, instigating immense potential to the market expansion. Excessive cost associated with the production and extraction process are primary factors for high astaxanthin price trend. The probability of adulteration in the product along with clean label requirements may pose a further challenge to the industry participants. For instance, the FDA has approved astaxanthin as a colour additive for only the specific uses in fish and animal foods, that provides red colour to the meet. Stringent regulations regarding the product usage in direct human consumption products are another factor negatively impacting the industry growth. Regular innovations in the production of natural variants result in yielding of higher-quality products with minimal wastage. Cultivation, extraction, and drying are among major techniques for optimal utilization of resources. The sealed microalgae cultivation system is an emerging technology that has gained prominence among the industry participants. It leads to significant reduction of entrapment risk of foreign substances, microbial contamination, and agricultural residue. This further results in waste reduction and high yield. These innovations will offer stable growth prospects to the market growth over the next seven years. 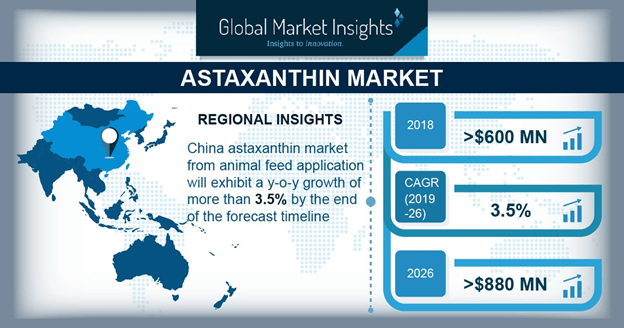 Astaxanthin market from animal feed will dominate the industry, accounting over 40% share of the global demand. The high revenue generation is attributed to its extensive usage as a prominent ingredient, especially in aquafeed. Increasing government support for promoting aquaculture is further strengthening the product demand as a pigment colouring agent. Moreover, the approvals granted by international food agencies, including Canadian Food Inspection Agency and European Food Safety Agency will support the industry growth. Dietary supplement is expected to grow rapidly, witnessing 4% CAGR from 2018 to 2024. Higher consumption of the natural astaxanthin as a key ingredient to provide certain health benefits will remain a key factor driving product demand. Easy product availability in most countries, coupled with the provision of various cardiovascular benefits will further add to the revenue generated. Moreover, dietary supplements with carotenoids lead to increased plasma concentrations, resulting in controlling of pain. These factors will further strengthen the product penetration in dietary supplements over the coming years. Synthetic source will acquire a major share in the market, with over 55% demand by the end of 2024. Synthetic astaxanthin is most commonly sold product form, largely used for animal feed applications. It is produced by a highly intricate process from petrochemicals and is fed to fishes to provide pigmentation. Cost effectiveness from the counterpart will further support higher revenue generation till 2024. 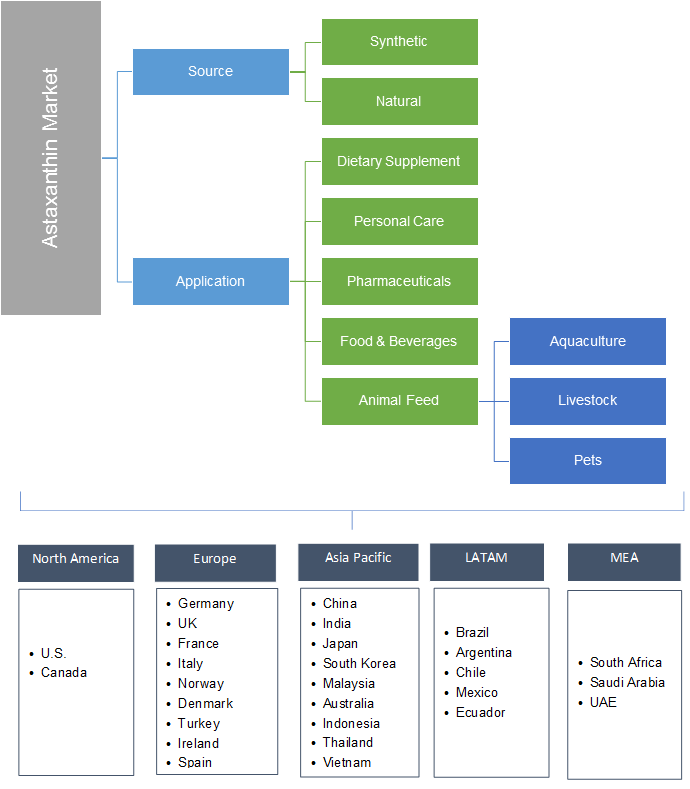 Astaxanthin market from natural sources will grow significantly, exhibiting 4% CAGR over the next seven years. The substantial growth is attributed to its high preference over the natural counterpart along with its health benefits for human and animals. Several aquaculture companies are also procuring natural variants instead of synthetic counterparts, even at a higher price. Moreover, it provides better pigmentation for a few species of fishes as compared to the synthetic. These benefits will result in its proliferating sales, further strengthening the industry penetration. Asia Pacific is the key contributing region, generating over USD 250 million revenue by 2024. Substantial product demand for animal feed application across the region will primarily contribute to the high growth business. Presence of established industry participants such as BGG in China along with their advanced operating facilities will further propel the industry growth. Moreover, rising consumer awareness regarding its health benefits coupled with huge population with nutritional deficiency will propel the regional growth. Proliferating demand for cosmetics owing to enhanced results is another factor supporting the regional dominance till 2024. The North America market will exhibit over 3.5% CAGR from 2018 to 2024 owing to huge demand from the dietary supplement industry coupled with growing awareness about health benefits offered by the product. Moreover, the region has witnessed the presence of various health related organizations, including Natural Algae Astaxanthin Association (NAXA), that is strongly involved in creating awareness regarding ingredient benefits. The presence of health-conscious population is another factor further impacting the industry positively over the forecast timeframe. Cardax, BASF SE, Nippon Oil & Energy Corporation, BGG, Fuji Chemical Company, and INNOBIO Ltd. are among the noticeable participants in the astaxanthin market. Other prominent players include Contract Biotics, Mera Pharmaceuticals, Algatech, Piveg Inc., Synthetic Genomics Inc., Otsuka Pharmaceutical Co. Ltd., and Divis Nutraceuticals. The industry participants are focusing on business expansion to enhance their visibility among their customers. For instance, in March 2016, Beijing Ginkgo Group (BGG) created a new subsidiary, Algae Life Sciences for astaxanthin production. It resulted in achievement of an organic astaxanthin certificate by the company. Similarly, in May 2017, Cardex made an announcement of its significant initial sales of astaxanthin finished products. Strategic agreements are another strategy adopted by the industry players to strengthen their position in astaxanthin market. For instance, in September 2014, Algatech entered into an R&D agreement with SCHOTT AG, a German company, to boost its productivity of its closed tube cultivation system. These strategies will offer stable growth prospects for the competitors across the globe. Astaxanthin, a keto carotenoid chemical compound and a part of terpenes chemical compound group. Its production is majorly carried out through microalgae cultivation or via other natural sources such as Phaffia yeast, Para coccus bacteria, etc. The product has gained high prominence in animal feed industry and is used in aquaculture as a pigment. It is also being extensively used as anti-oxidant in the nutraceutical industry. High usage in cosmetics industry and fortification of food & beverages are among key factors driving the industry growth. The inclusion of this ingredient in pharmaceuticals also helps in improving the human stamina to achieve rapid recovery from joint & muscle pain and wounds. However, high production cost may hamper the growth of industry participants.